This fifth-wheel trailer hitch hauls trailers up to 20,000 lbs and features a lockable double jaw on a floating head for effortless hookup. Hitch height adjusts from 13" to 17". Rails and universal 10-bolt installation kit included. 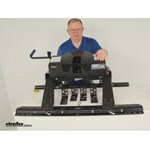 Call 800-298-8924 to order Pro Series fifth wheel part number PS30132 or order online at etrailer.com. Free expert support on all Pro Series products. 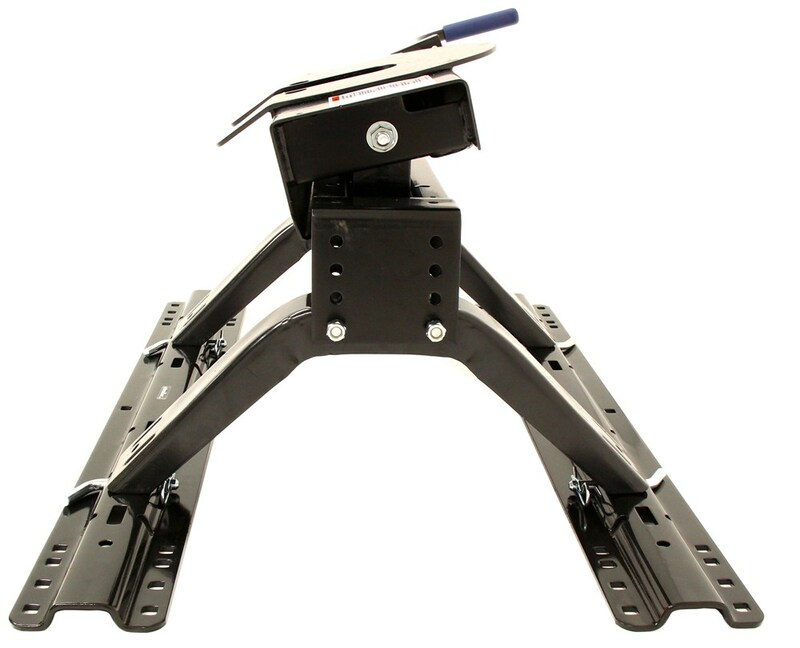 Guaranteed Lowest Price and Fastest Shipping for Pro Series 5th Wheel Trailer Hitch w/ Rails and Installation Kit - Dual Jaw - 20,000 lbs. Fifth Wheel reviews from real customers. Note: This fifth-wheel trailer hitch will not fit trucks with beds shorter than 6' unless used with a Sidewinder. It will also not fit trucks with flareside/stepside beds. This fifth-wheel trailer hitch features a floating head that pivots four ways to provide a full range of motion for easy trailer hookup. 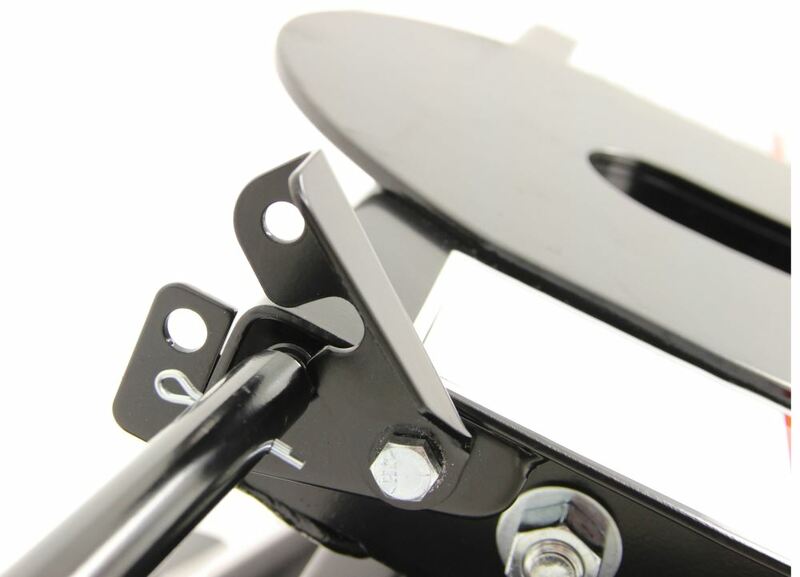 The fifth wheel head assembly can be easily removed by one person - simply remove two pins and two clips. 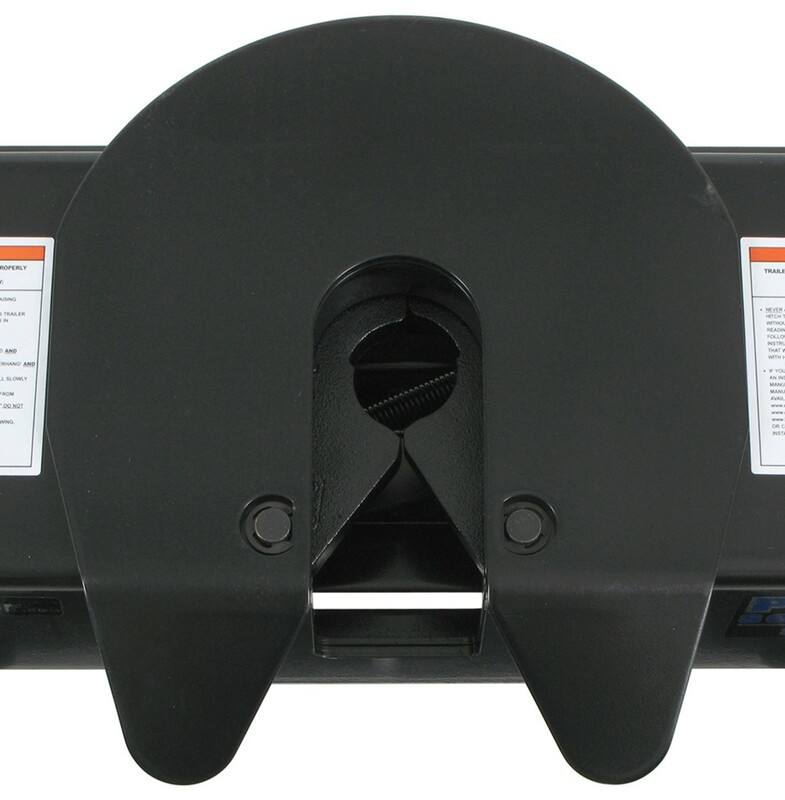 The fifth-wheel head securely grabs your trailer's king pin with double jaws. The double-jaw design is unique in that it completely surrounds the king pin, ensuring a solid connection while reducing wear on the king pin and hitch. The double-jaw connection also minimizes play at the hitch connection point, creating a smoother ride. The jaw is operated by an easy to grab, 1" diameter handle with a cushioned grip that makes jaw operation even more comfortable. The jaw handle includes an integrated tab that is lockable with a padlock. Using a padlock secures your trailer to the hitch. 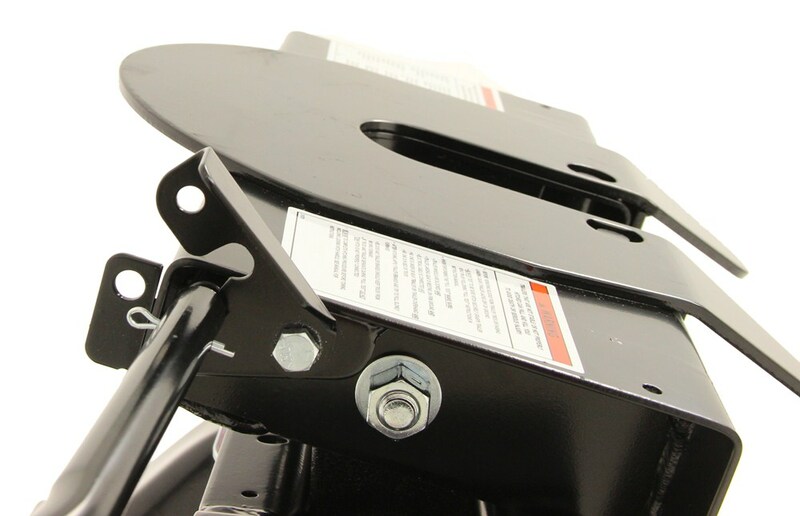 Fifth-wheel pull-pin lock plates (RP58093; sold separately) can be used to secure the hitch to the truck. 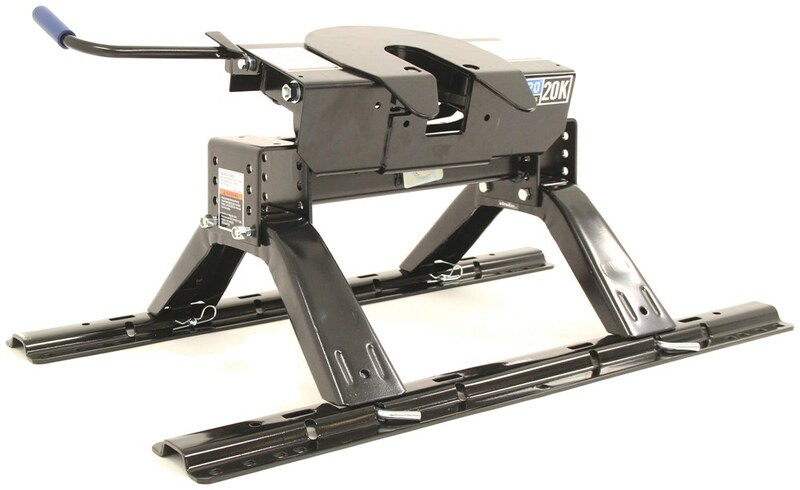 Specially designed for heavy-duty towing with medium-duty, cab-and-chassis-style trucks, this low-profile fifth-wheel trailer hitch offers 3" of height adjustment and mounts directly to your truck's frame - no rails required. you can see will completely surround your trailer's king pin to ensure a nice, tight connection. It helps reduce wear on the king pin, and on the 5th wheel hitch. Also produces a smooth ride with minimum play at the hitch connection point. You'll notice the full-floating head right here pivots 4 ways . front to back, and side to side. 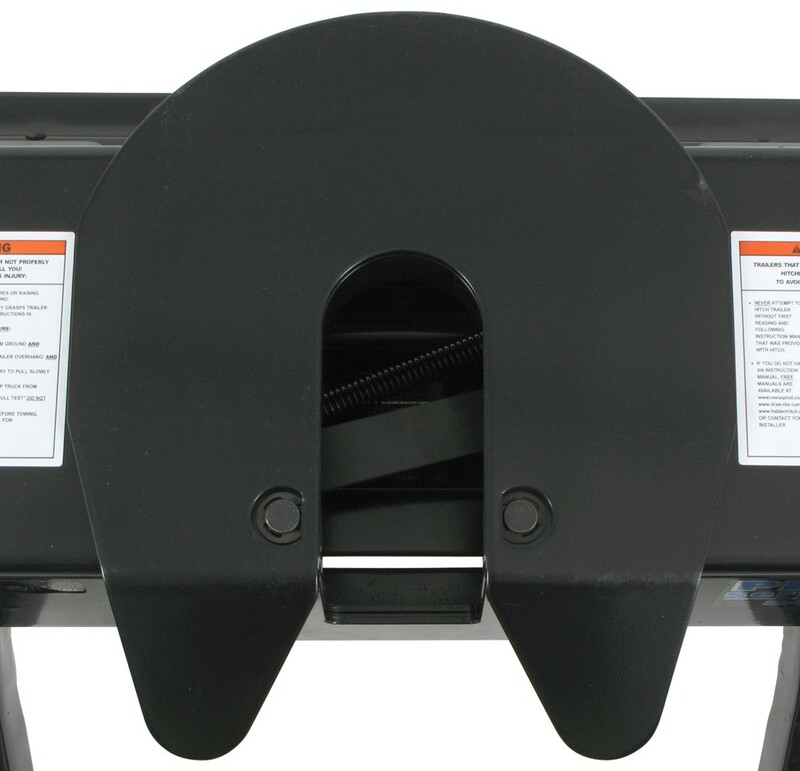 This will provide a full range of motion for easy trailer hook up, even on unlevel ground. The handle right over here has a nice cushion grip on it, so when you grab it it will provide a comfortable jaw operation. There's actually a tab here on this jaw handle, which is lockable, and you use the included padlock right here to lock it into place. This will basically lock your 5th wheel trailer to the hitch. So basically, if you go to hook up your trailer . if you pull out on that handle .. you'll hear a click. you can see this latch has a hole in it. Then there's a tab welded on with a hole in it on the head itself. Once the jaws are closed around the king pin, just push that latch down and it'll hold that handle into place and keep the jaws from opening. For the extra security . you could take this included lock here and just open it up, run it through both holes, push it into place and it's locked. Then nobody can open that up and remove your 5th wheel from your hitch. Also, I want to show you on the side here the crossmember that attaches to the legs. On both sides, the crossmember will have 4 rows of 2 holes each. What that allows you to do is when you put these bolts through to connect your crossmember to your legs, you can put them at whatever height you would need to get the correct hitch height . from your truck bed to the top of the plate here,	This is adjustable. Basically, if you put these bolts in the very top holes . which would be your lowest setting . that would give you a hitch height from your truck bed to your plate of 13 inches. If you put them all the way to the bottom holes . which would raise it the highest . it would give you a hitch height from the bed to the top plate of 17 inches. This will allow you to accurately match whatever trailer you will be towing. Also, the design of this hitch makes the 5th wheel hitch easy to install and to remove. Basically this head . when you go to remove this, you don't want to try to lift this whole thing off the rails themselves. What you'll want to do is to make it easier . right up here; I'll point to it. You'll notice this is a pivot pin. What this is is a large bolt, or pin, that goes through. There's a pivot beam in here that allows this to move on the crossmember. This pin will go through that pivot beam. On the back of it is a large castle nut with a cotter pin. You remove that cotter pin, remove that nut . you'll be able to pull this pivot pin right out, and that will allow you to lift the whole head and the pivot beam underneath here out of the crossmember. That'll cut down on the weight you'll be lifting, so you don't have to try to remove the whole thing at once. Once that's out, then you can pick up the crossmember and the legs and take it out of the rails to give you full truck bed access when you're not towing. These 1 piece formed legs right here . they do create a nice wide footprint for superior stability. Now this part number does come with the 10 bolt rail, showing here. It comes with the installation kit, which are these 4 brackets right there. Turn this around a little more. Now the rails and these brackets are a part number RP30035. It is included on this part number. You can also buy those separately if you just had the hitch. Now if you have the hitch and the rails, and you need a installation brackets, we also sell the vehicle specific 5th wheel brackets which are sold separately. What that allows you to do is depends on your application. It isn't available for every application, but if you put in your vehicle year, make, and model, and if it has the vehicle specific brackets . the nice thing about those instead of the universal is that it'll work with these rails, but allows you to cut the installation time in half. Basically they're made to use holes already in your truck frame, or you'll have to drill with them. You can bolt it right up in about half the time of using the universal kit, where you might have to do some drilling or modifying. Now the gross towing weight capacity on this is 20,000 pounds. The vertical load limit, or pin weight capacity, is 5,000 pounds. Again, we mentioned the hitch height adjustment is anywhere from 13 inches to 17 inches. If you'll notice this funnel that allows the king pin to slide into here. The widest point of that opening measures about 5 and 3/4. Just want to show you again. Also, one other thing to mention is on this pivot pin I was mentioning to you right here . on this pivot pin right at the very front is a little grease zerk. Basically, what that fitting is for is you can hook your grease can up to that and pump grease into the . to lubricate this pin when it moves on the pivot beam. You want to maintain that every so often to make sure you've got some grease in there. Now just to show you again how this operates, if you flip open the latch, your dual jaws are right here. If you pull the handle to open it up . clicks open. The jaws are fully open. Back your king pin into there. Once it's fully in, release it. It'll wrap around your king pin. Put your latch down. Use the included padlock to lock it into place. That should do it for the review on part number PS30132, the Pro Series 5th wheel trailer hitch, with the rails and the installation kit all included. .
Order: RelevanceNewestRating - High to LowRating - Low to High This fifth-wheel trailer hitch hauls trailers up to 20,000 lbs and features a lockable double jaw on a floating head for effortless hookup. Hitch height adjusts from 13" to 17". Rails and universal 10-bolt installation kit included. In order to use a Reese Revolution Pin Box with the Pro Series 5th Wheel Trailer Hitch part # PS30132 you will also need the Sidewinder Wedge Kit part # 30850. Once you obtain the wedge there will be no capability issues and they will work fine with one another. The hitch you referenced is our part number # PS30132 which is a Pro Series 20k hitch on a set of universal install rails. These both would fit your 2008 Chevy Silverado 2500HD long bed just fine. I attached a set of install instructions for the rails that detail how it would install in your vehicle. 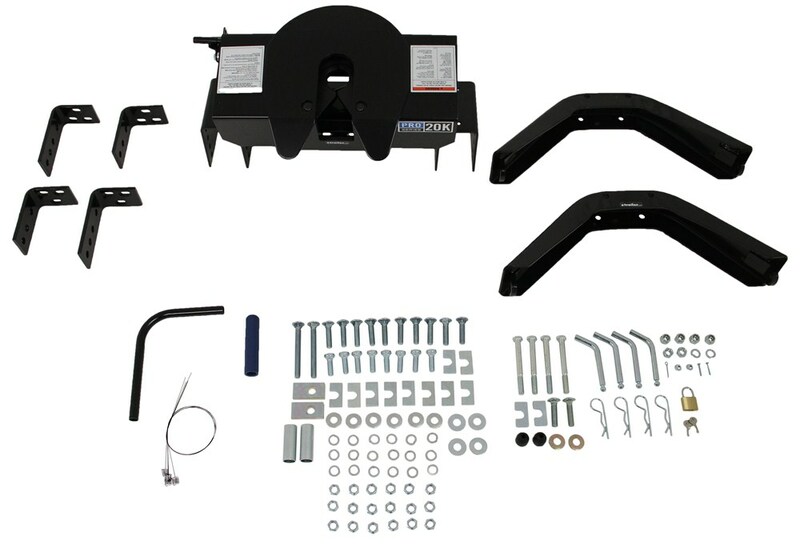 The Pro Series 20K hitch with universal installation kit is actually part # PS30132. The universal installation kit fits the 2007 to 2015 Toyota Tundra Double Cab with 6-1/2 or 8 foot bed. If you have an older model it will not fit. If you do have a short bed model then you would want the slider version, # PS30133. I spoke with my contact at Pro Series who said that they do not have replacement jaws for your 5th Wheel Trailer Hitch # PS30119. Unfortunately you need to replace the whole head assembly instead which is part # 30118 on our site. 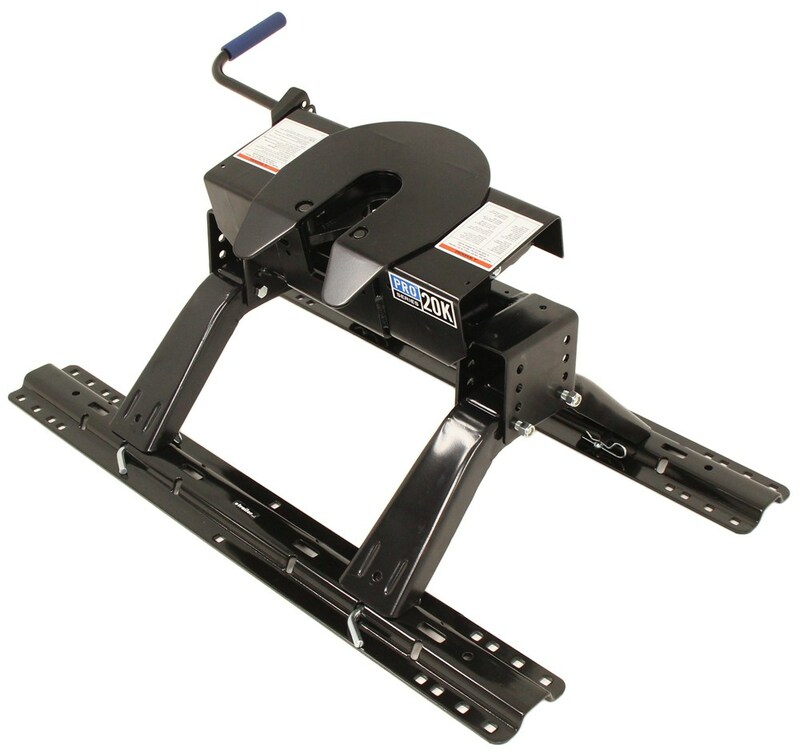 The # PS30132 Pro Series 5th Wheel Hitch w/ install rails you mentioned is compatible with your 1996 F350 long bed. I have linked you to the installation instructions for the rail kit. The instructions that apply to your vehicle are on page # 11. I have also linked you to an FAQ article about 5th wheel hitches. It sounds like you are looking for replacement latch # 30416. This latch fits many Reese, Draw-Tite, Pro-Series, and Hidden Hitch 5th wheel hitches including your 20K Pro Series hitch. It does not fit the 15K Pro Series but will fit the 20K model. The Pro Series 5th Wheel Trailer Hitch w/ Rails # PS30132 referenced in your question is confirmed to fit your 2012 Chevy Silverado 2500HD with the 8 foot bed. This kit includes the Reese Universal Base Rails and the needed installation hardware. This is an all-in-one type kit and nothing else will be needed to install base rails to your truck and attach the Pro Series Hitch. I have included a short video demonstration on this hitch that you can also take a look at. 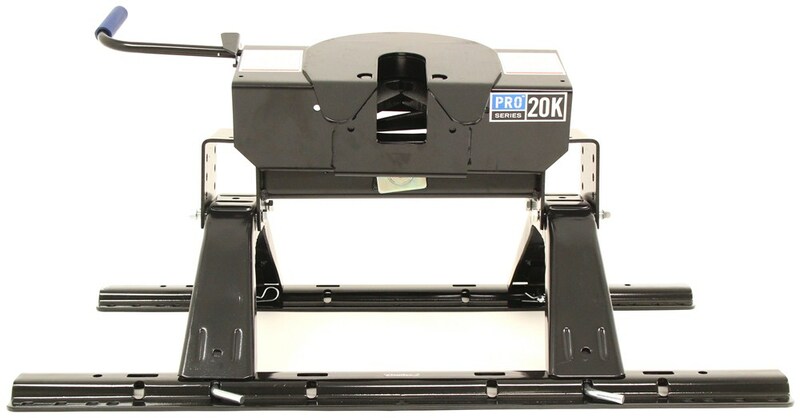 Does the Pro Series 20k 5th Wheel Hitch Head Pivot Side to Side? 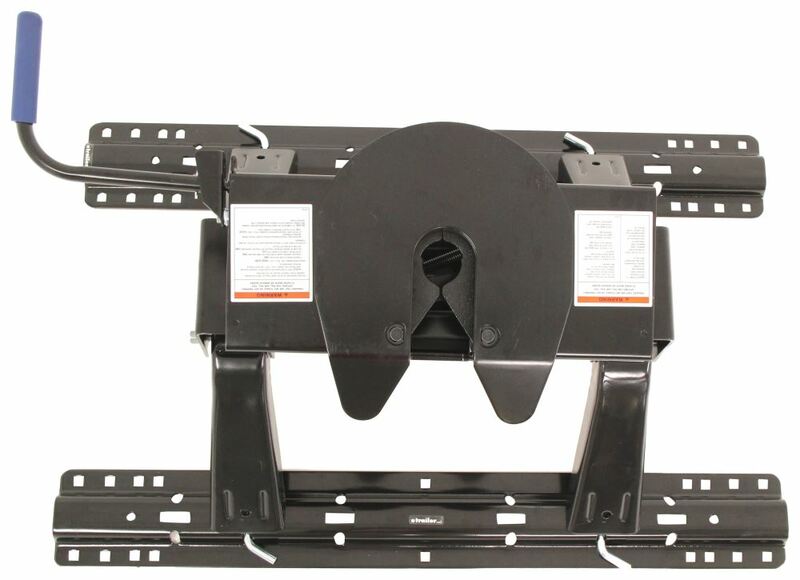 The Pro Series 5th Wheel Trailer Hitch w/ Rails and Installation Kit # PS30132 does have a head that pivots side to side as well as front to back. You can see this in the attached video towards the end of the video. This movement is to help with connection as well as to adjust for uneven road conditions. The Pro Series 5th Wheel Trailer Hitch w/ Rails and Installation Kit - Dual Jaw - 20,000 lbs, # PS30132, is a fit for your 1997 Ford F-350. This system is a universal application. It includes all the hardware, the brackets, rails, and the hitch. I've attached an installation video for you to check out. You may also be interested in the 7-Way Pre-Wired Car Connector, 7' Lead, # 20023, which would allow you to put a 7-way trailer connector in the bed of your truck for easy connection.